The Banjaran Hotsprings Retreat (The Banjaran), Sunway and Malaysia’s first luxury natural wellness hot springs destination, introduces four new distinctive dining escapades under its Dine & Dream food journey. Drawing inspiration from the destination’s intrinsic natural surroundings, the menus are rooted in strong culinary sensibilities and highlight ingenuity and variety. Locally-sourced ingredients are cleverly used to titillate the palate with delicate international flavours. This latest Dine & Dream programme is certain to entice discerning food and travel adventurers to visit Ipoh’s most experiential and ethereal culinary destination; further reaffirming the Ipoh’s recent recognition by Lonely Planet as “Asia’s top destination for food”. Diners have four bespoke choices, each themed to heighten the novelty of the venue in which it is set amidst the sprawling retreat. The Dine & Dream options are Star Struck, Secret Escape, Sizzle & Flames or In-Private, with prices starting from per person. One of the most sought after Dine & Dream programmes is the Star Struck. 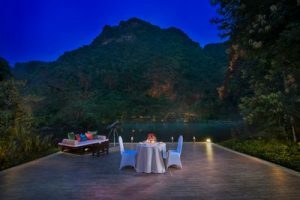 Diners are ushered to a private deck overlooking the hot springs lake, set against a breathtaking backdrop of towering limestone hills. Priced from RM650 nett per person, a seven-course set dinner menu is served as diners embrace nature’s twilight and dine under the stars. The venue comes complete with a telescope to catch a glimpse of the stars. For an ethereal dining experience, The Secret Escape takes diners into the awe-inspiring Jeff’s Cellar, a magnificent voluminous cave chamber build into a cavern of a 260 million-year old limestone hill, making it one of the most unique restaurants in world. Diners can choose from a selection of seven-course set dinner menus, priced from RM500 nett per person. Sizzle & Flames cocoons diners into The Balcony, a private cave chamber that overlooks the retreat’s hot springs lake. The lantern-lit cave is tucked away in the lush tropical gardens offering guests an enchanting private dining experience with a dash of Dine & Dream signature sparkle. Priced from RM650 nett per person, an extensive barbeque menu of premium meats and seafood, marinated to perfection served by an attending personal chef. In-Private takes dining-in to a new level of privacy. At a chosen area in the villa, guests are able to sizzle their own barbeque selections. Priced from RM500 nett per person, choose from an extensive menu of premium meats and seafood; complemented by a salad and dessert bars. In-Private is available for lunch and dinner and ideal for guests staying at The Banjaran. Prices are quoted in Ringgit Malaysia (RM) inclusive of 10% service charge and prevailing Goods & Services Tax (GST). For reservations, call The Banjaran at Tel: +60 5 210 7777, email to tbhr.reservations@tsunwayhotels.com or visit https://www.thebanjaran.com. The Banjaran’s Dine & Dream is also open to external guests. Advanced reservation is required.